The Fairline Holiday was the most popular craft to date built by Fairline with over 590 boats built. This semi displacement deep V hull with rounded shallow transom section was designed by John Bennett. The design produced a craft suitable for inland and sheltered coastal use. The interior design offers 2 conventional V berths to the bow section with 2 further berths extending aft under the cockpit. This was one of the first designs of cruiser with an elevated cockpit height giving good cruising vision. Some craft have been re-engined over the years. 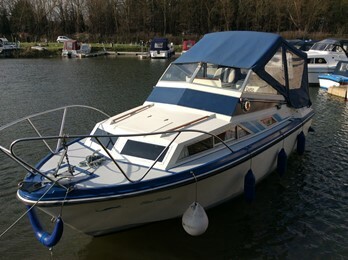 The Fairline Holiday mk3 was slightly longer at 22ft 5ins/6.83m and its beam was 8ft 9ins/2.67m. It was built between the years 1972-1984.